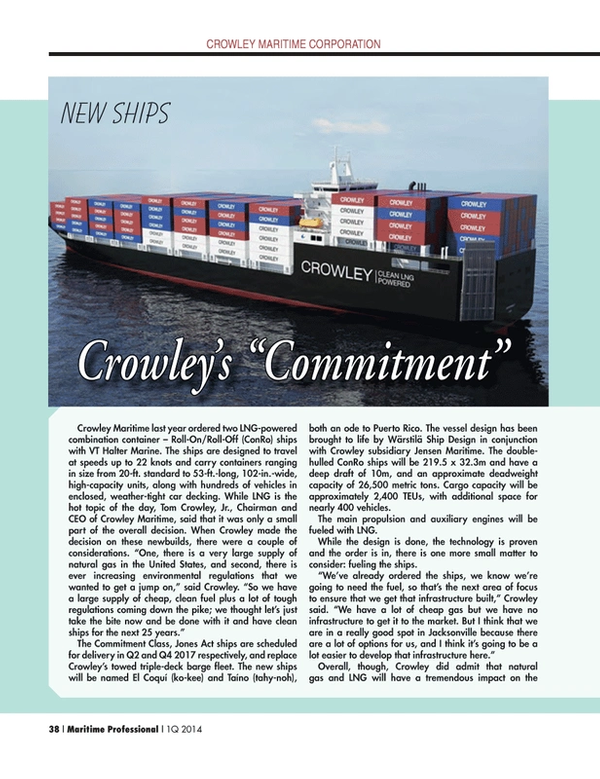 The Commitment Class, Jones Act ships are scheduled for delivery in Q2 and Q4 2017 respectively, and replace Crowley’s towed triple-deck barge fleet. The new ships will be named El Coquí (ko-kee) and Taíno (tahy-noh), both an ode to Puerto Rico. The vessel design has been brought to life by Wärstilä Ship Design in conjunction with Crowley subsidiary Jensen Maritime. The double-hulled ConRo ships will be 219.5 x 32.3m and have a deep draft of 10m, and an approximate deadweight capacity of 26,500 metric tons. Cargo capacity will be approximately 2,400 TEUs, with additional space for nearly 400 vehicles. The main propulsion and auxiliary engines will be fueled with LNG. While the design is done, the technology is proven and the order is in, there is one more small matter to consider: fueling the ships. Overall, though, Crowley did admit that natural gas and LNG will have a tremendous impact on the business of Crowley Maritime overall. “It is going to have a huge impact on a lot of different parts of our business,” Crowley said. “What we’re trying to do now is to compartmentalize it so that we can have some focus and put resources into the areas that are going to give to us the most benefit early. So Jensen, for example, the naval architecture group, is a part of our company that gets involved in things early on design and development, and that is a key market for them.